Fee: Free to members or with admission to the sculpture garden. Family passes for nonmembers will be available at the door for $20. Lynden welcomes winter with a day of outdoor art-making, studio activities, tours and tree-walks, and whatever winter activities the weather permits. Elisabeth Albeck and Neil Gasparka are planning this year’s events, assisted by Jenna Knapp, Willy Dintenfass, Braden Baer, Ashley Janke and Sarah Luther. Artist Caleb Engstrom is flying in from New York to create an outdoor cinema, and you'll be able to help him make seats and your own stop motion animations for the day-long screening. Ashley Janke will conclude her year as a Lynden artist-in-residence with a final exhibition in the nAbr gallery: Ashley Morgan's Let's Build Something Together. Jenna Knapp is master-minding studio activities and an outdoor scavenger hunt. Sharon Morrisey returns for a tree walk, and Winter Carnival sponsors Davey Tree Expert will show you how they climb our big elms in the winter. We'll be making frozen flower molds and then planting them around the Little Lake (where, if the weather cooperates, you'll be able to skate). The art studio will be open for stop motion animation-making with Wesley Cathon and Eric Zimmerman in the morning (stick around and watch your work on the ice screen in the afternoon), and candle-making and cookie decorating in the afternoon. Plus we'll have The Simmer Truck on hand all day, serving hot panini sandwiches, hot soup, hot drinks and more! Other activities: face painting by Ashley Janke , an outdoor games arena, a visit from the Kite Flying Club and another from All Hands BoatWorks (with an example of the canoe you'll be building in their February workshop), and an outdoor performance project from artist-in-residence Kim Miller. Watch or participate on foot, skis, snowshoes or skates (bring your own). Additional thanks to Arctic Glacier. whose work is striped with the impact of the communities he inhabits. From Iowa City, Iowa, to Brooklyn New York, and within more abstract social spaces (the internet), Engstrom creates dynamic projects and presentations that draw from a collective, yet idiosyncratic experience, with a sense of revelry and emotional resonance. Engstrom comes to Lynden to present his project "On Ice," a cinema in two iterations. One: an ongoing indoor screening of film art works sourced from online networks, accompanied by several works by Milwaukee area filmmakers including Michael Walsh, Renato Umali, Joanna Hanlon and Elisabeth Albeck. Two: an invitation to an outdoor "ice theatre" that will include the opportunity to build your own theatre chair with snow and modular plywood pieces designed by Engstrom, as well as a ceremonial sourcing and sharing of freshly shaven ice to make snow cones, or "snow concessions," flavored to your tastes. Join Engstrom in the Ice Cinema from 10am-4pm for an animated gathering of neighbors, and catch the screening of curated works indoors from 10am-1pm. Members of All Hands BoatWorks, a Milwaukee nonprofit organization that uses wooden boatbuilding as a means to support positive youth development, education, and workforce preparation, will be at Lynden with an example of the type of canoe built during their workshops. If you'd like to build your own canoe with All Hands BoatWorks, sign up for their workshop at Lynden, beginning February 22. Artist and Lynden summer camp assistant Jenna Knapp has devised a fiendishly fun scavenger hunt suitable for all ages. Start at the house, where you will create a team name and receive your first clue. Then off you go around the garden, exploring sculptures, circumambulating the ponds, ducking behind trees. Jenna promises us that many surprises await, and that every team that finishes will receive a prize. Ashley Janke concludes her year-long artist residency at Lynden with a final show in her outdoor nAbr Gallery: Ashley Morgan's Let's Build Something Together. 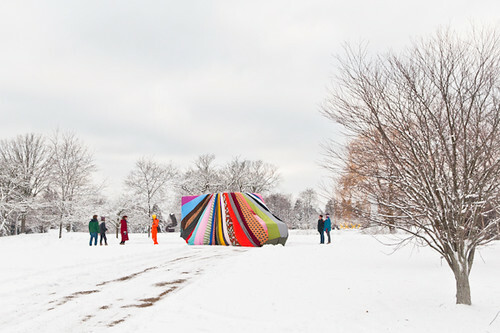 Janke launched the nAbr Gallery -- a micro-venue on the Lynden grounds -- at last year's Winter Carnival with "Gathered From Various Other Reliable Sources," a project by Minneapolis-based artist Andy Sturdevant. Since then, nAbr has housed exhibitions by Patrick Sharrow, John Riepenhoff, Sarah Luther and Hideous Beast. With Let's Build Something Together, Ashley Morgan moves from exploring ideas around building a domestic space, maintaining a sense of control, and leading viewers towards an experience of comfort, to working collaboratively with anyone who chooses to help, allowing others to shape the work, and relying on a natural building material (snow) to achieve uncontrolled and unanticipated results. A still image can convey a message, introduce a character, or present a feeling.The act of animation can be accomplished by breaking a story down frame by frame, and connecting sequences of images that build off of each other. Winter Carnival visitors of all ages are invited to make their own stop-motion animation pieces, under the guidance of local filmmakers and art educators Wesley Cathon and Eric Zimmerman. Explore materials, textures and colors, and create a film short all your own from 10 am-1pm. Stick around for a screening of the workshop films at 3 pm. Milwaukee County UW-Extension, for a talk and tour that focuses on trees in the winter landscape. The tour will begin on the patio, where your guide will lead you on a walk that loops around the lake where you will identify some of the unusual trees at Lynden (Shagbark Hickory, European Beech, Amelanchier or serviceberry, Bald Cypress, Dawn Redwood and more) while discussing how the texture, color and forms of trees can enhance the landscape in the winter months. Bring your questions for the tree expert! In wintertime, our eyes are drawn to the smallest signs of life and color; impossibilities warm the senses. Come defy the ice and snow, and playing your own lively winter garden! Using bright and tantalizing colored flowers, visitors are invited to create ice compositions, using flowers like paint and ice like canvas. Plant your blossom-filled compositions in a "garden" around the Little Lake. All ages welcome from 11 am-3 pm. Please note that this activity may require two visits during the day, as ice flower paintings take time to set. Lynden artist-in-residence Kim Miller brings her Milwaukee Institute of Art & Design students to the carnival for "Performing the Subject." Working collaboratively, the students will present performative responses to the question of how action and language determine a subject. Visitors can observe and interact with the projects, which range from performance to a photo opportunity for visitors to sculptural responses to the landscape. Students will present from 11 am to 12 noon, and from 1 pm to 2 pm, on the grounds near Quartet 1967/2013 by Forrest Myers. 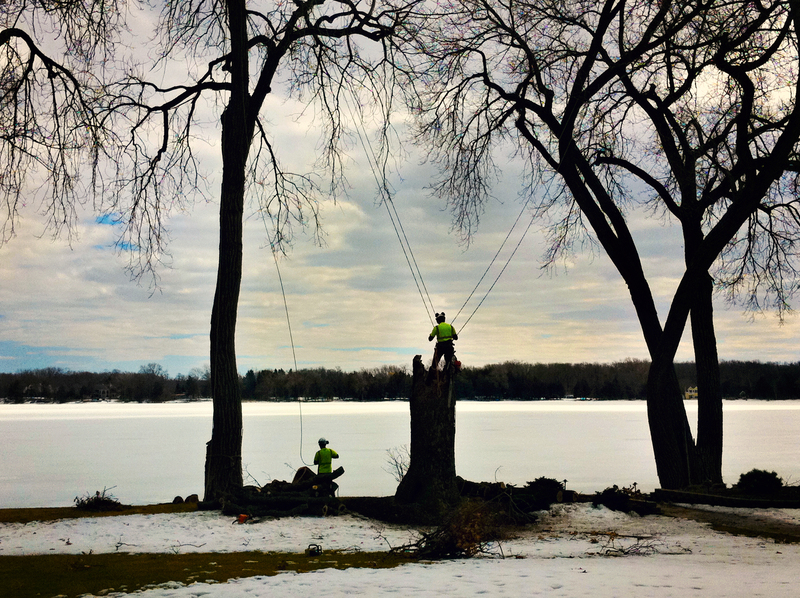 Winter Carnival sponsors Davey Tree will give a demonstration of the techniques their arborists use to climb tall trees in the winter. These activities are designed as drop-ins and are open to all ages (young children may need parental assistance). Make candles the old-fashioned way, by dipping a string in wax; decorate cookies with hearts, snowflakes, sprinkles and icing! Kite Flying Club is a project of artist Sarah Gail Luther, whose work often brings elements of nature into populated urban spaces to create contexts for social gatherings. Meetings of Kite Flying Club bring people to unlikely Milwaukee spaces to share in a joyful experience of kite flying, conversation and camaraderie. For Winter Carnival, Luther brings Kite Flying Club to the outskirts of the city, and Lynden's natural environment. From 1:30-3 pm, visitors are welcome tojoin Luther -- no matter the weather -- on her picnic blanket for a kite flying session, a chat, and a warm beverage straight out of the thermos. Capture the scene with your mobile device, and share it on Instagram @lyndensculpturegarden. Gather in the conference room for a screening of films created during MAKE YOUR OWN STOP MOTION ANIMATION WITH WESLEY CATHON AND ERIC ZIMMERMAN, which runs 10 am-1 pm in the art studio.